Learning a language and becoming fluent in that language is a long and complicated process. Much of it revolves around grammar rules and their exceptions along with discourse rules and how native speakers use language to communicate with one another. But knowing all these things won’t get your students very far if they don’t know vocabulary – individual words in the English language and what they refer to in the real world, be it the things we see around us or things we can’t see. My guess is that no matter what area of English you are teaching, you probably include some element of vocabulary in your class. 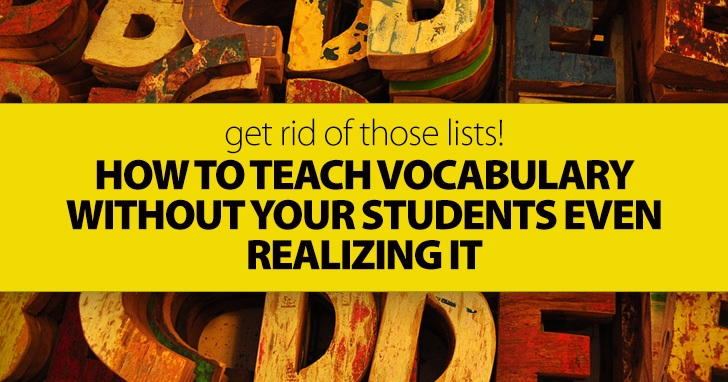 The good news is you don’t have to subject your students (or yourself) to boring lists of vocabulary words that only offer a tedious memorization task. You can teach your students vocabulary without them even knowing what you are doing. Here are some ways you can slip those English words into your students’ subconscious and then conscious minds. There is a reason that most people envision language classrooms with labels on everything from the clock to the pencil sharpener. Labeling the items in your classroom is a great way to teach vocabulary to your students without them even realizing it. Ok, so they might realize you have labeled the items so they will remember the names that go with each, but they might not realize they are also learning spelling whenever they read those simple classroom labels. My advice to any English teacher is to label everything. You don’t need anything fancy – just scraps of paper and a black marker will make labels sufficient for this purpose. If you are worried about the labels showing when your students are taking tests, just cover them up. Get yourself a stack of large sticky notes and cover up what you don’t want your students to see during the test. It’s simple, and having the labels there reaps more benefits than the trouble it takes to cover them. 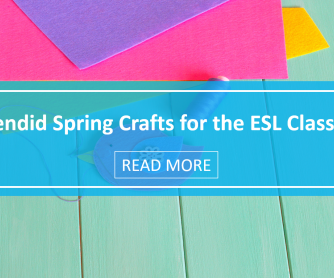 Not every ESL student will need to learn the names for the objects in your classroom. Those words are basic English after all, but don’t let that stop you from decorating with vocabulary. Put posters around your room that include or center around English words. Motivational posters are one option. They usually offer a nice picture with some less familiar words underneath. If your students’ attention wanders during a lesson, they just might wander over to the saying on the poster and end up internalizing the words they see there. Grammar posters are a great option, too. Posting grammar rules around your classroom does double duty. Your students internalize the rules they read, and they also internalize the words with which those rules are written. You can also keep posters that your class creates specifically for vocabulary development. Write out your current vocabulary list and post it on the wall, post a collection of words related to an upcoming holiday, or post words that follow particular spelling patterns or pronunciation rules. All of these words on display in your classroom will help your students internalize vocabulary every day, and you won’t have to take time out of class to teach them. You have probably noticed it yourself and seen me write about it before: ESL teachers tend do decrease their speaking vocabulary without even realizing it in order to communicate more easily with their students. It’s happened to me, and I’d bet it’s happened to you, too. You can help your students learn more vocabulary by keeping your own words in check. Don’t’ simplify your language. In fact, do more than that. Include words in your spoken English that you know your students don’t already know. When you use the words you want your students to learn, they will learn them. Don’t settle for saying, “Good job,” ten times a day. Change your words up: excellent work, well done, I’m impressed, you should be proud of yourself, great performance, etc. Expose your students to a variety of vocabulary right from your own lips, and they will eventually absorb what you are saying. And while you are focusing on using unfamiliar words in your own speaking, try saying everything to your students in more than one way. Take your books out and Get out your textbooks may sound the same to you, but they won’t sound the same to your ESL students. Every word they haven’t encountered is a new opportunity for them to increase their vocabularies. But when you say things more than once and use different words to get your meaning across, you are actually doing two things. First, you are introducing them to new words. Second, you are also telling them what those words mean. If your students understand what take out your books means, they can probably figure out what get out your textbooks means, too. New vocabulary introduced and defined? Check. Do you keep English reference books in your classroom? You should. English only dictionaries can make a huge difference in what your students learn and how well they learn it. I am a big proponent of English only dictionaries rather than bilingual dictionaries, and you can help your students increase their vocabulary with these simple tools just by keeping them on hand in your classroom. When a student looks up a word in an English only dictionary, he finds a definition, you guessed it, in English. Likely, that definition will contain words your student does not understand. Now the point is not to send your students on a chain reaction definition hunt, going from one word to the next until he forgets the word he looked up in the first place. But likely, your student can get the gist of a definition even if he doesn’t understand every word, and those words he doesn’t understand, when he encounters them in enough contexts, will begin to work their way into his receptive and then productive vocabularies. Likewise, a thesaurus is a good reference book to keep around the classroom. Seeing a group of words with similar meanings, even if your students don’t at first understand the nuances that make them individual words, will help your students learn vocabulary in clusters, another great vocabulary learning tool. Vocabulary will always be a part of learning English, but it doesn’t always have to be the main focus of a lesson. These are easy ways to slip new vocabulary into your students’ minds and mouths without making it a big deal. Try it and see for yourself. How do you slip vocabulary into your students’ day?